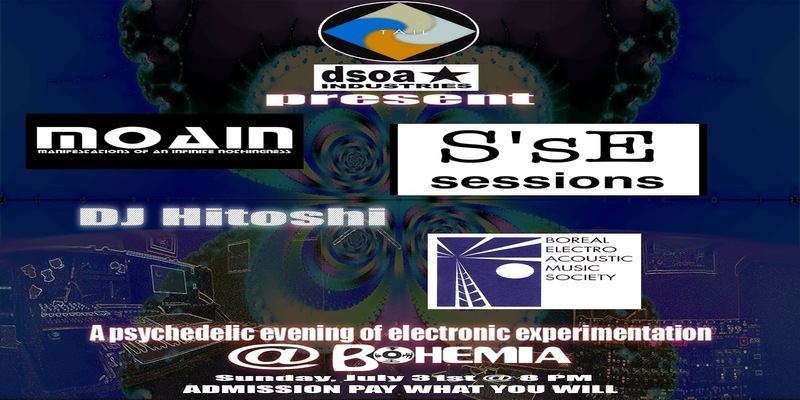 S’sE SESSIONS will provide a musical backdrop for eight eclectic talented artists for the live portion of the event, A psychedelic evening of electronic experimentation. himiko becomes a cat and bangs keyboard. piece description --- a cat plays with a keyboard and interacts with the sound and rhythms she hears, and sometimes she ignores everything, just being a selfish cat. Mark Meloche has been performing harsh noise since 2004, using the name Damno Te at the beginning. This show he will performing his modified snowshoe. Andrew Hall / Frozenlake121 is an experimental artist who keeps one foot in the digital realm, the other in the electro-acoustic, and his heart in creative exploration. His piece "Fork In The Rhodes" is both prearranged and improvised on laptop and office intercom units. The downtempo minimalist electronics reflect a somber consideration of recent events, things to come and the painful indecision that binds it all together. As one's thoughts run in circles, a feedback loop ensues. But only if you let it. Philip Jagger is an Edmonton based musician who likes to push the edges of poetry, music, sound and video. This piece is the mediation of temple in the forest to the mediation of the temples of video games - temple arcadi is the piece. 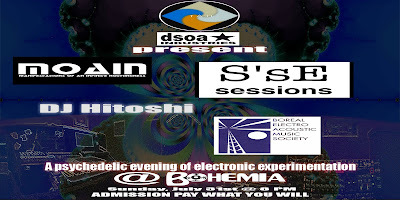 Long time member, Shannon Land will also be performing during this set.